My Hero Academia TV anime show released on Saturday the first footage for the anime’s fourth season at Jump Festa ’19 event first debuted the trailer on Saturday. 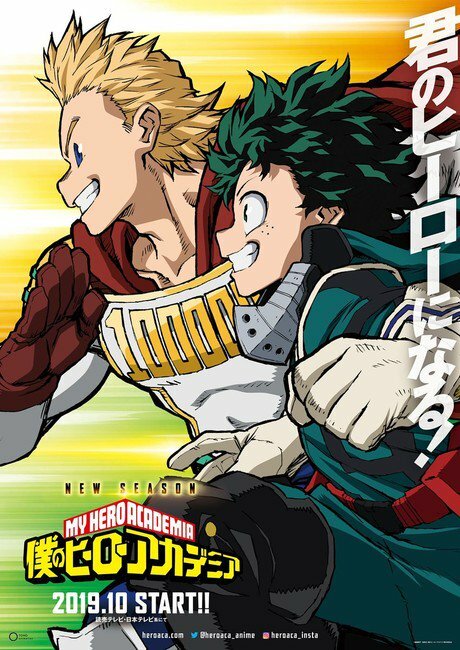 The 4th season of the TV anime show adaptation of Kōhei Horikoshi’s My Hero Academia (Boku no Hīrō Akademia) manga series will premiere October 2019. The anime series premiere date was revealed along with the shows new key on Friday. A video game based on the anime, My Hero Academia: Battle for All, was released in Japan on May 19, 2016 for the Nintendo 3DS. The second video game, titled My Hero One’s Justice, was released for PlayStation 4, Nintendo Switch, Xbox One and Microsoft Windows on October 26, 2018. Legendary Entertainment announced in October 2018, that the company had acquired the rights to produce a live action adaptation of My Hero Academia.